Brownie had been at a shelter for two years, and was slowly beginning to deteriorate. She was the longest resident at the Town of Hempstead Animal Shelter, and desperately needed to get out. Thanks to an article by The Examiner, she found her knight in shining armor. 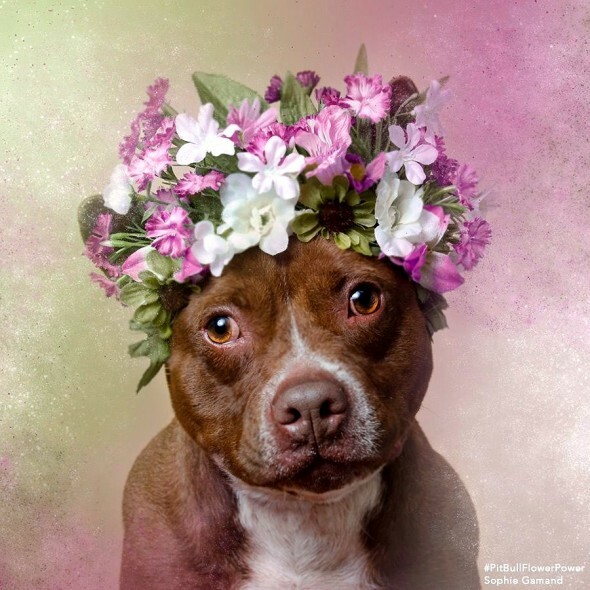 The wait is over, here is the first of our beautiful dogs to join the #pitbullflowerpower series by Sophie Gamand. We decided to post this one first, because it is the most urgent… Please read to the end. For 25 long, excruciating, lonely, stressful months, our girl Brownie has endured life inside the walls of our shelter. Brownie, who is just shy of 3 years old (and a petite 40 pounds), has not only spent the majority of her life here, but is also our LONGEST resident in the entire building. Out of approximately 140 dogs, this girl has sat and waited the longest out of anyone else. As she grew up inside our kennel, she watched as dogs came and left, getting adopted into loving homes, while she sat and waited, and frankly, deteriorated. Two years is too long for any animal to be caged, but it has really taken its toll on Brownie and we need her to get out of the shelter before she deteriorates further. Due to Brownie’s length of stay with us, her deterioration here, and her unhappiness about being locked up most of her life, to be honest, she doesn’t look good in the cage (But can you blame her?). What Brownie needs is someone willing to overlook her cage behavior, and come to meet her OUT of the cage. 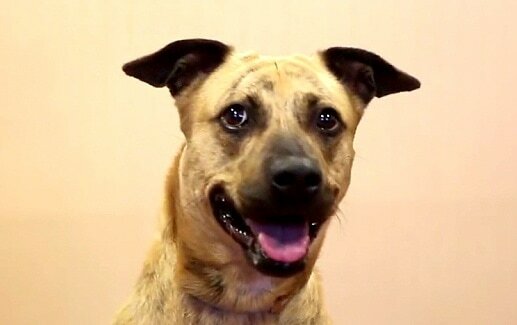 Let Brownie show you who she can be, let Brownie win you over with her soulful eyes, playfulness with other dogs, and her inspiring determination to get through this time in her life and make it to happier days. She knows there is someone out there for her, but it is our responsibility to find that person. Brownie has waited long enough, and her time is coming to an end. Her time is NOW to get OUT of the shelter and into a loving home – for her own well-being and sanity, we can’t let her sit here another day. Hello. EVERYONE! I hope someone sees this. My name is John Coban and I just came back from the town of Hempstead Animal Shelter and met with Brownie. I filled out the application to foster her in my home. I had just lost my beloved black Lab four weeks ago and I am heartbroken. I’ve been seeing all these posts and articles on Brownie and decided I needed to do something. So now I am waiting to see if I am approved. Upon meeting Brownie, I noticed she’s a little skittish and growled at me a little. This kind of thing didn’t bother me. Being locked in a kennel for over two years would do that. Brownie is not big at all but looks healthy. She didn’t pay too much attention to me, being outside and smelling the grass and getting a bit of fresh air. No problem! I have two cats at home and was told Brownie seems okay with cats as well as dogs, but if approved I will take precautions, as well. The two main reasons I am posting this message is one, I want to let all those concerned about Brownie’s welfare that there is hope. Secondly, I had noticed that some people who posted, expressed a willingness to donate towards Brownie’s foster. If I do get approved, would anyone out there be willing to help with that? At the present moment, I’ve been unemployed for a year now and I also just lost my long time renter, who moved out. I am now doing eBay selling and hustling, but things are tight. 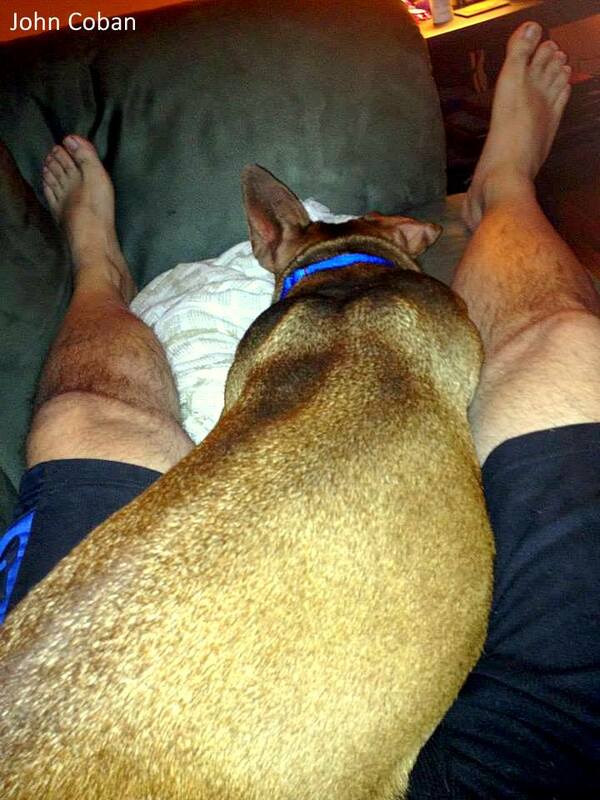 I want to make fully sure I can take care of Brownie without any financial distress. I feel crappy even asking for help but this is my situation. Nor am I looking to get rich or have a great time on other’s hard earned wages. Money means nothing to me other than its necessary to survive. So, with that said, I’m trying to gauge if there is a kind-hearted soul who can help. If not, it won’t deter me from helping Brownie. I will do the best I can on my own. Also, feel free to share this and/or inbox me. I will respond to ALL who do. Right now I am just waiting word and I will post as soon as I hear back from the shelter. Thank you all and let’s pray I get approved. Be well, everyone. 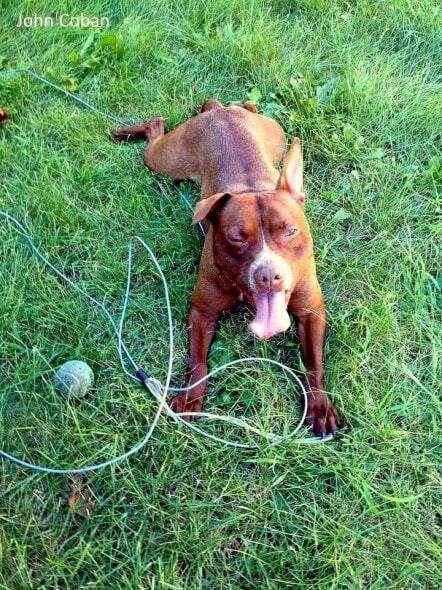 Hello, Everyone, my name is John Coban and I have terrific news regarding Brownie, the Town of Hempstead Animal Shelter dog that HAD been in her kennel cage for over 26 months and who hundreds of people inquired and commented about. BROWNIE IS NO LONGER THERE! Despite having lost my beloved dog, Mecca, just five weeks ago, who I am still grieving for on a daily basis and will be for a very long time, I began seeing posts from various rescue groups and even the online newspaper, The Examiner, regarding Brownie, who NO ONE was taking a chance on. Out of over 140 animals at The Town of Hempstead Animal Shelter, Brownie was there the longest. I was told she displayed growling in her cage and I suppose that was one of the reasons she was passed by. Well, being stuck in a cage for that long would do that to any animal or human for that matter. I said to hell with this, I had to do something, so I did. I went down to TOHAS and filled out the application to foster her. Right at this very moment, as I write this message, Brownie is NOW in my backyard on a nice, soft blanket and pillow, chilling and relaxing, while the warm sun bathes her brown coat. I’ve had Brownie now for four days and she is nothing but pure joy and happiness, quick to give licks and love and unfettered affection. For the life of me, I just can’t understand why no one took a chance on this beautiful creature. I’m glad I did. As I had posted earlier, I have been out of work for over a year now and despite being a proud soul, I would like to see if anyone would be willing to donate or make a real monetary pledge towards Brownie’s future care? 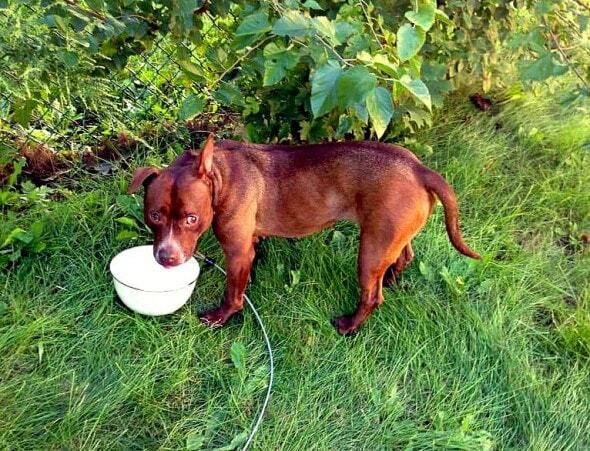 Many people who commented on Brownie, messaged they would help donate to her foster. Well, I suppose now that is me. I’m not looking to get rich on this but having just lost my dog, Mecca and being out of work for so long and being a homeowner in Nassau County, the most expensive county on earth, I know all too well how costly it is to feed, house and doctor these gifts from God. If anyone is willing, my PayPal account is [email protected] You can also inbox me on my Facebook page. Anything you can give would be greatly appreciated. Recent pictures of Brownie can also be viewed on my Facebook page, as well. Whoever sees this, please SHARE with EVERYONE. Thank you, again for your concern, regarding Brownie (She’s in terrific hands) and God bless to all animals and the humans who protect them…..
Petrinha is now Hempstead’s current longest member. This cutie is four years old and has spent half of her life in a shelter. Give her a home today! Click here for more info or call 516-785-5220. Brownie. God bless her and her family. ohhhhhh brownie!!!! what a sweet face!!! I think his comments about PayPal are inappropriate in my opinion and I’m worried about this dogs welfare and his intentions. Don’t start the “SH” and there won’t be any “IT”!! Xiomara Vera happy dog story. Well, I was going to donate but the link seems to be broken. I don’t think it’s inappropriate at all to ask for help. I would rather he ask for help than the dog end back up in the shelter. Some people are so cynical! Thanks for getting this precious baby out of that cage. I think this dog has been given the chance he needed in a loving home. If the money is only for the dog what’s the problem. I am glad she found her for-ever home at last !! 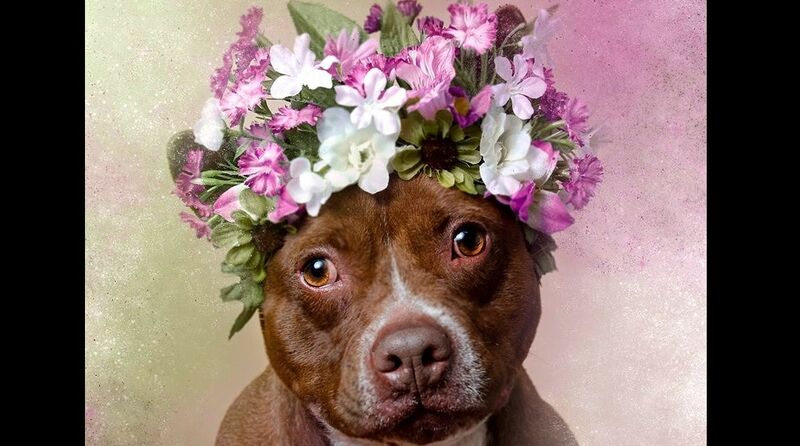 I think the flower cap is a great way to draw attention to this pup! Most dogs tolerate being dressed for photos because they love being with their humans and getting attention. I don’t think this dog feels any loss of dignity – that is human thinking projected onto this situation. Anyone criticizing the flowers . . . this was an incredible photography project that has brought amazing POSITIVE attention to many shelter dogs in need from a talented photographer Sophie Gamand Photography and the dogs have a great time participating! That’s so sweet she has finally found a home. . Glad for her & her new family. . Picture of her is adorable. . I think the dog looks great and the photographer….did an awesome job. Susan Richardson, if you don’t like it, get off the page. The people that help these animals in anyway they can do not need negative comments and show some respect toward them please. Fostering MEANS the animal is still up for adoption. Awe what an adorable picture of her & so glad she finally got adopted. Awww she’s beautiful. Thank you for giving her a home. What a doll! Bless you!! This is my local town shelter. I was so happy to see this when it happened! I adopted my kitten from there in July…they really try to find homes for all of them! Why didn’t they try to foster her out ? Why let her sit there for 2 years? yeah, if pitbulls would stop mauling people and other animals. My Heart just skip’d a beat…..
I’M GLAD YOU NEVER GIVE UP HOPE…. So pleased this lovely dog has a new loving home. Rosamaria, please take your cat to the vet, ASAP! Don’t want to scare you, but this is not normal behavior. Something is wrong and she needs to see a vet. Thanks that this doggie find a home. To Ms Rosamaria Rivero please take ur cat to veterinary I think he need to examine by the vet. Hurry. Did you adopt her Emily Avenson? God bless Brownie for having a loving home. Good on you she was waiting for you !!! I didn’t understand. Thank you for pointing it out and now I believe it’s a lovely idea and hope it goes a long way towards helping people understand the breed. I love this picture and I am so happy that she found a forever family. Very cool story. Makes my day. Thank God for that good person who gave her a home! I love her hat! God bless you Brownie and your new family. So don’t beg for help when your laying on the ground bleeding to death when ones eating your leg. REALLY??? That’s your response to a wonderful story of a precious creature being saved??? Jesus Christ, Cristene get a life you miserable cow. yes, dogs do attack but don’t forget all dogs can attack , not only pitbulls. if you are so against this breed what the hell you’re doing on this site? Wonderful someone adopted her. she’s lovely & will give lots of love.